above: former Niagara Falls Customs and Post Office, on the north-east corner of Zimmerman Ave. and Park St., circa 1919. Note that the street we know today as Zimmerman Ave. was then called Clifton Ave. Photo from the Niagara Falls Library archive. above: same view, May 5, 2008, photo by R. Bobak. View is looking east along Park St., Zimmerman Ave. crosses left to right. A Michigan Central Railroad bridge is seen crossing Park St. in the right distance. Beyond the railway bridge, in the far distance behind the trees, is seen a high-rise building - this building is located in the United States, across the Niagara River gorge! below: First "Trackless Train", displayed on the Park St. side of the old Post Office, ca 1925. "Funded by Metro-Goldwyn-Mayer and the U.S. Tire Company, the Trackless Train operated like a truck, but outwardly looked like a locomotive train. It featured an engine, cab, and a combination dining and sleeping car. 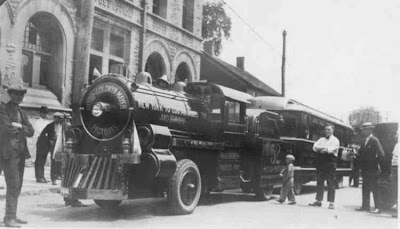 The trackless train made a cross-country trip from New York City to Los Angeles from March 1925 through March 1926, in order to promote the development of a national highway system as advocated by Herbert Hoover. In Dayton the National Cash Register Company allowed its 6500 employees time off to view the train. The Sandusky Register, June 24, 1925, reported that the rubber tires on the novel vehicle had been driven for 5850 miles without going flat." Details provided by Sandusky Library Archives. " So here was the foreshadowing of transportation yet to come... this vehicle (disguised, ironically, as a train) promoted the construction of future interstate highways, yet also consequently led to the demise of the train as a primary passenger carrier! The very-busy-at-the-time Michigan Central Railroad tracks ran just behind the Post Office where the trackless train was displayed: the abutments of the railroad bridge which crossed Park St. can be seen at the far right in the old photos above and the new photos below. The great Michigan Central line entered Canada just a block away behind this building. In fact, as this "trackless-train" was being displayed, the MCR had just built a brand new railroad bridge here in 1925, replacing their earlier Cantilever bridge over the Niagara river. 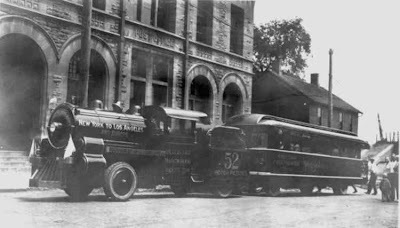 The MCR line ran from this location in Niagara Falls, through a straight cannonball run across southern Ontario farm country, all the way to Windsor, where it re-entered the United States again; this was part of their main route from New York City to Chicago. By 1999, the MCR bridge and the trackage all the way to Windsor were abandoned. This building was also a police station until the 1970's. below: The morgue scene, in the film "Niagara", was shot here, showing Marilyn Monroe walking into the building through those front doors on the corner, seen at the bottom right. 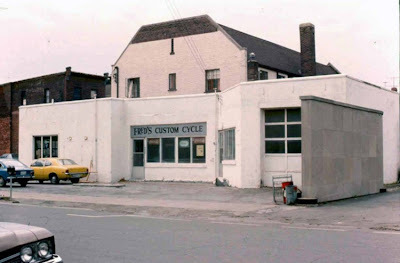 The scene was filmed here on June 11, 1952, while many fans watched the exterior action, as the policeman, played by Irish actor Denis O'Dea, led Monroe into the "city morgue' to look at a body. 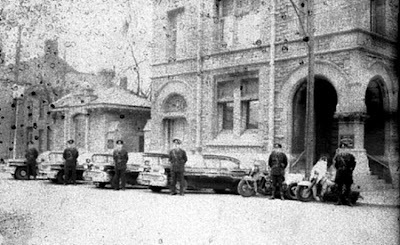 The photo below looks northwards along the east-side of Zimmerman Ave. At the far left is seen the former Imperial Bank of Canada building, which stands at the south-east corner of Zimmerman Ave. and Bridge St.
above: the same view as above, seen on Apr.9, 1959, with Niagara police officers standing by their cruisers (Chevys!) and motorcycles parked along Zimmerman Ave. in front of the then-active police station. 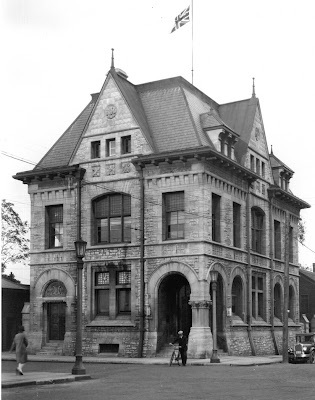 above: closer view of the former Imperial Bank of Canada building, at the s/e corner of Bridge St. and Zimmerman Ave. Click here for a view of the same building as it was seen in 1919. The Hamilton Travel Ageny building is seen at the far right. below: W.J. Hamilton Travel Agency in Oct. 1975.
above: the W.J. 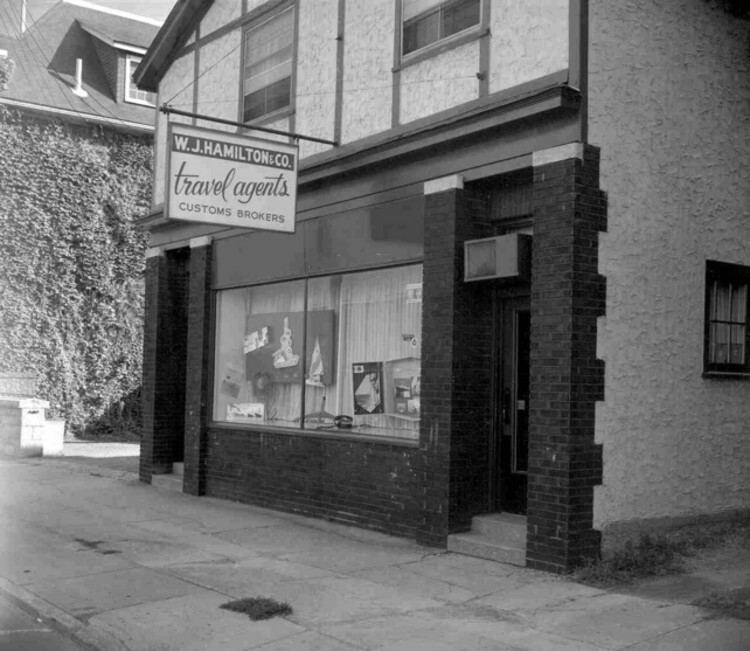 Hamilton Travel Agency as seen Sept.28, 1965. The ivy-clad rear wall of the Imperial Bank building is seen at the far left. below: Oct.27, 1975, looking at the J.A. Newport Ltd. offices. 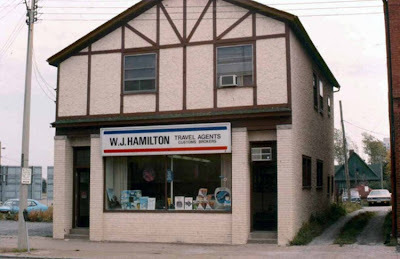 The Hamilton Travel Agency was in the building seen at the far left. above: same view, 2010, now home to Affiliated Customs Brokers. A bit of the former Hamilton Travel is seen at the far left. below: summer 2010 - residential building on the north-west corner of Zimmerman and Park St.: this building is directly across the street from the old Customs and Post office building seen previously. Zimmerman Ave. is seen running along the bottom. above: same view, Oct.1975, when this was home to Fred's Custom Cycle shop, at 4567 Zimmerman Ave. 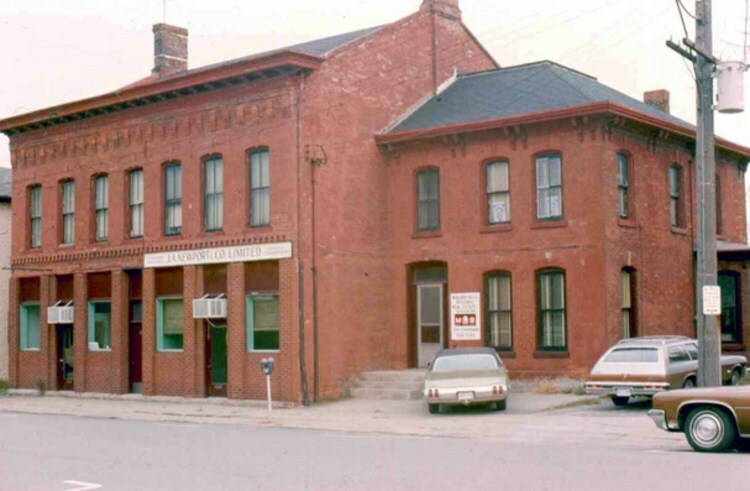 Note, at the far-upper-left distance, the top of another building is seen; this building faced onto the south-side of Park St., and in the 1970's was part of St.Jude's men's shelter; it was torn down in May 1976 - see more here. I hope you have enjoyed reading about these aspects of Niagara's past.